Seventy-nine-year old Honorata Ilaya has gone through a lot. She was married twice, raised seven children by herself. Her eldest son died in an accident decades ago and only one of her six remaining children sends her an allowance of P1,500 a month. But that is not enough, so she still has to to find any means of paid labor, even with her old age. Honorata used to live in a small house in the middle of a field in the village of Sagbayan Sur in Sagbayan town, Bohol. That was before a 7.2-magnitude earthquake — the strongest one in recent history — all but decimated the island province in October 2013. Only one wall and the roof were left standing… the rest, reduced to rubble. She moved to a small tent made of wooden poles and tarpaulins just a few steps away. Honorata lived there for nearly a year. Thankfully, much-needed help arrived. 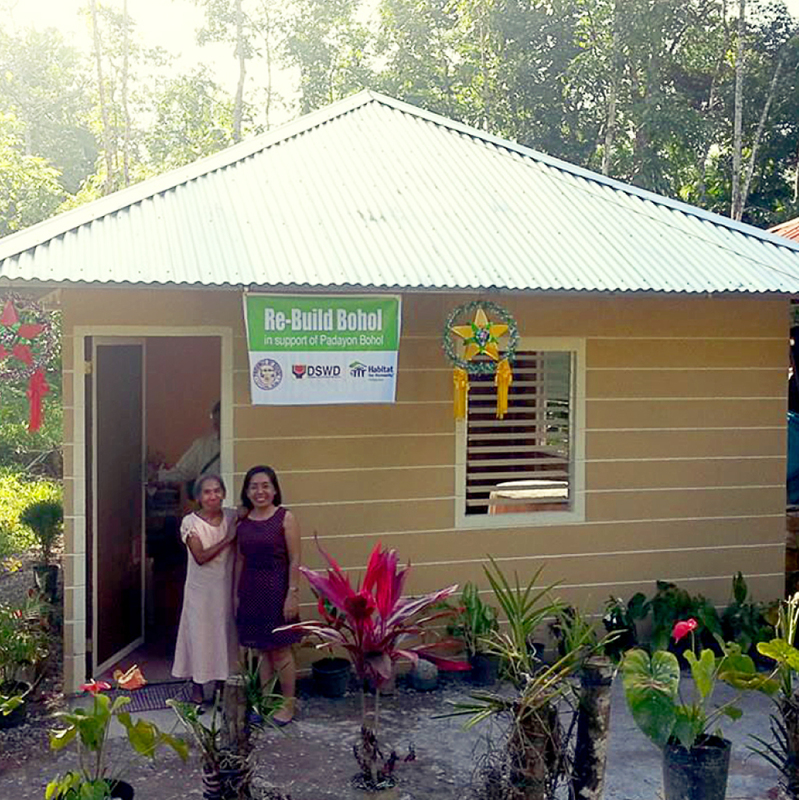 Early last year, Honorata was chosen as one of the recipients of Habitat for Humanity’s housing program in Bohol. The organization partnered with the Philippine Department of Social Welfare and Development (DSWD) to provide permanent, earthquake-resilient housing for nearly 6,000 families across 17 towns in the province. Construction of Honorata’s new home began in her backyard on the third week of September last year. The flexible structure, made of reinforced steel frames and tightly-woven bamboo strips plastered with concrete, is meant to endure strong earthquakes. Honorata personally gathered, stripped and cured the bamboo strips as her labor contribution to the building. 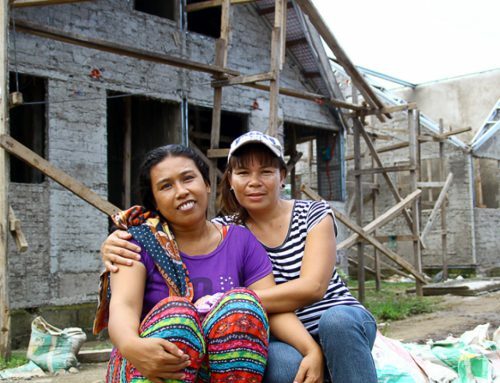 Honorata patiently waited and painstakingly worked to build her new home. All the while, she never lost her faith or hope. She maintained her positive disposition all throughout. In fact, her motherly nature earned her the moniker, “Nanay” to her neighbors. 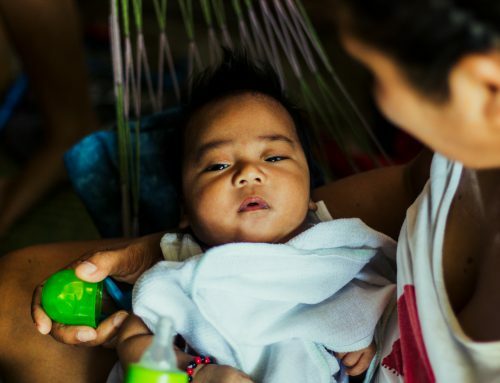 But despite being surrounded by people who regard her as a mother, she still hopes that she would see her six remaining children so that she could share in the joy of having a new and better house. 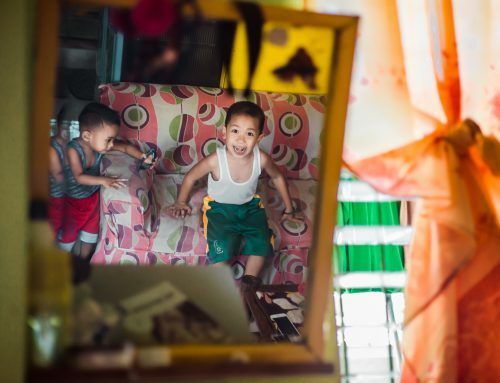 “Any good thing,” she says, “is worth the wait.”Nanay Honorata believes her house, a symbol of family, new beginnings and togetherness,would be the catalyst to reunite with her children again and make the the house a home. And it did just that. 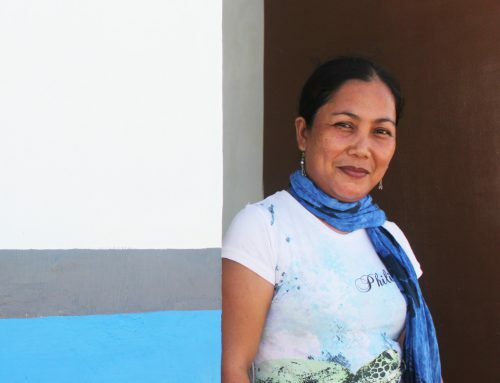 Last November 8, her daughter flew in from Cagayan De Oro just to be with her the day she dismantled her small, run-down tent and moved into her new and improved home from Habitat for Humanity and DSWD. It was a very special day for Honorata — the day her house truly became a home. Hope truly isn’t lost. Nanay Honorata waited this long, and it was well worth it. Inspired by what you read? Get more involved.